Scorpius constellation lies in the southern sky. It represents the scorpion and is associated with the story of Orion in Greek mythology. Scorpius is one of the zodiac constellations, first catalogued by the Greek astronomer Ptolemy in the 2nd century. Its symbol is ♏. Scorpius pre-dates the Greeks, and is one of the oldest constellations known. The Sumerians called it GIR-TAB, or “the scorpion,” about 5,000 years ago. Scorpius is the 33rd constellation in size, occupying an area of 497 square degrees. It lies in the third quadrant of the southern hemisphere (SQ3) and can be seen at latitudes between +40° and -90°. The neighboring constellations are Ara, Corona Australis, Libra, Lupus, Norma, Ophiuchus and Sagittarius. Scorpius belongs to the Zodiac family of constellations, along with Aries, Taurus, Gemini, Cancer, Leo, Virgo, Libra, Sagittarius, Capricornus, Aquarius and Pisces. Scorpius contains four Messier objects – Messier 4 (M4, NGC 6121), Messier 6 (M6, NGC 6405, Butterfly Cluster), Messier 7 (M7, NGC 6475, Ptolemy Cluster) and Messier 80 (NGC 6093). It also has 13 stars with known planets. The brightest star in the constellation is Antares, Alpha Scorpii, with an apparent magnitude of 0.96. Antares is also one of the brightest stars in the sky. There are two meteor showers associated with the constellation: the Alpha Scorpiids and the Omega Scorpiids. In one version of the myth, Orion tried to ravish the goddess Artemis and she sent the scorpion to kill him. In another version, it was the Earth that sent the scorpion after Orion had boasted that he could kill any wild beast. In ancient Greek times, the constellation Scorpius was significantly larger and comprised of two halves, one with the scorpion’s body and the sting, and one containing the claws. The latter was called Chelae, or “claws.” In the first century BC, the Romans turned the claws into a separate constellation, Libra, the Scales. Antares is a red supergiant star with a visual magnitude of 0.96, approximately 550 light years distant from the Sun. It is the brightest star in the Scorpius constellation and the 16th brightest star in the night sky. Sometimes it is referred to as the 15th brightest star if the two brighter components in the Capella (Alpha Aurigae, located in Auriga constellation) system are counted as one star. Antares is the most massive, brightest and most evolved member of the Scorpius-Centaurus association, the nearest OB stellar association to the solar system. The star belongs to the spectral class M1.5lab-b and has the radius about 883 times solar. It is approximately 10,000 times more luminous than the Sun, and has between 15 and 18 solar masses. The star’s estimated age is about 12 million years. Antares is classified as a type LC slow irregular variable star. The star’s magnitude slowly varies from 0.88 to 1.16. It has a companion star, Antares B, about 529 astronomical units (AU) away. Antares B has the stellar classification B2.5 and an apparent magnitude of 5.5. It is 170 more luminous than the Sun and has an orbital period estimated at 878 years. Antares marks the heart of the scorpion, which is also its alternative name. 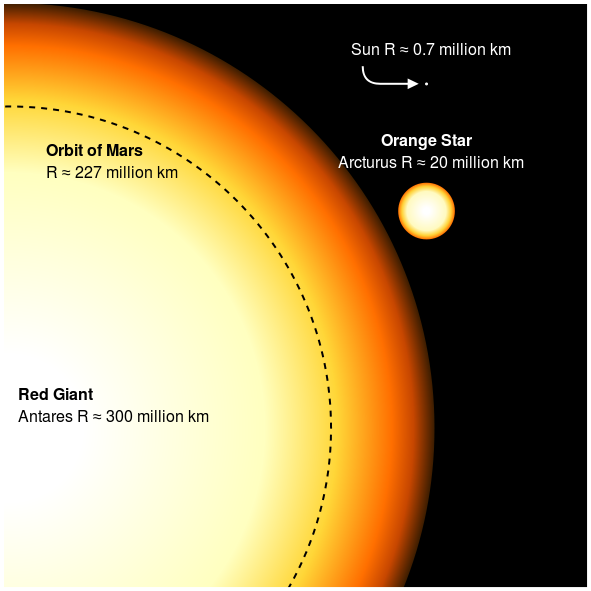 The name Antares comes from the ancient Greek Άντάρης, which has been translated as “anti-Ares,” “rival of Mars,” or “like Mars,” referring to the similarity of the star’s red hue to that of the planet Mars. The comparison possibly dates way back to Mesopotamian astronomers. Another theory suggests that the name Antares may have come from the name Antar or Antarah ibn Shaddad, which was the name of an Arabic warrior-hero celebrated in the Golden Mu’allaqat, one of the seven long Arabic pre-Islamic poems. Lambda Scorpii is a multiple star system with three visible components, Lambda Scorpii A, Lambda Scorpii B, and Lambda Scorpii C. Lambda Scorpii A is a triple star system composed of two class B stars and a pre-main sequence star. Lambda Scorpii B lies 42 arc seconds away from the first component, and Lambda Scorpii C is a 12th magnitude star 95 arc seconds away from component A. The primary star in the Lambda Scorpii A system is a Beta Cephei type variable. The estimated age of the star system is about 10-13 million years. Beta Scorpii is another multiple star system in Scorpius. In small telescopes, it appears as a binary star with two components separated by 13.5 seconds of arc. The brighter of the two components is itself a binary star with an orbital period of 610 years and its own brighter component is a spectroscopic binary, with components separated by only 1.42 miliarcseconds and orbiting each other every 6.82 days. The other visual component also has two subcomponents with an angular separation of 0.1328 and an orbital period of 39 years. The dimmer subcomponent is yet another spectroscopic binary star with an orbital period of 10.7 days. The two most massive stars in the system are main sequence stars belonging to the spectral class B. Each has at least 10 solar masses and both are expected to end their lives in massive Type II supernova explosions. Delta Scorpii has the stellar classification B0.3 IV and is approximately 490 light years distant. It has a visual magnitude of 2.307. The star has a class B companion orbiting it every 20 days, and another star in a very eccentric orbit that orbits the primary star every 10 years. Delta Scorpii’s traditional name, Dschubba (or Dzuba) comes from the Arabic jabhat, which means “the forehead,” referring to the scorpion’s forehead. Sometimes the star is also known as Iclarcrau or Iclarkrav. Theta Scorpii is an evolved bright yellow giant star belonging to the spectral class F0 II. It has an apparent magnitude of 1.87 and is approximately 300 light years distant from the solar system. The star has 5.7 solar masses, 26 times the solar radius, and is 1,834 times more luminous than the Sun. It has a companion with an apparent magnitude of 5.36 located 6.470 arc seconds away from the primary star. The star’s traditional name, Sargas, is of Sumerian origin. The meaning of the name is unknown. Epsilon Scorpii is a giant star with the stellar classification K1 III. It has a visual magnitude of 2.310 and is 63.7 light years distant. The star has a radius almost 13 times that of the Sun. It is classified as a variable, as its brightness varies slightly, only by 0.01-0.02 magnitudes. Kappa Scorpii is a spectroscopic binary star, composed of two stars that cannot be resolved with a telescope. The stars have an orbital period of 196 days. The combined spectrum of the Kappa Scorpii system has the stellar classification of B1.5 III, which signifies the presence of a giant star in a late stage of evolution. The primary component in the system is classified as a Beta Cephei type variable, which is to say it is a star that exhibits variations in brightness as a result of pulsations of its surface. The star is 17 times more massive than the Sun and has almost 7 times the solar radius. The secondary component is also much larger than the Sun, has about 12 solar masses, and almost 6 times the solar radius. Pi Scorpii is a triple star system with a combined visual magnitude of 2.9. It is approximately 590 light years distant. The brightest components in the system form an eclipsing binary star classified as a Beta Lyrae type variable. Beta Lyrae variables are close binary stars that exhibit variations in total brightness because they orbit each other and periodically block each other’s light. Both stars are hot main sequence stars with the stellar classifications B1 V and B2 V. Both are rapid rotators, with projected rotational velocities of 108 km/s and 87 km/s. The distance between them is believed to be only around 15 solar radii. The third component in the system is a distant companion with a visual magnitude of 12.2, located at least 7,000 astronomical units away from the main pair. The primary star is 21,900 times more luminous than the Sun and has about 12-13 solar masses. Nu Scorpii is another multiple star system in Scorpius, approximately 437 light years distant from Earth. It is composed of two close groups of stars separated by 41 seconds of arc. The brighter group consists of B2 class subgiants and the fainter pair is comprised of class B8 and B0 main sequence dwarf stars. Nu Scorpii illuminates the reflection nebula IC 4592. Xi Scorpii is another multiple star system in Scorpius. It consists of at least five stars forming two groups that are separated by 4.67 arc minutes. The brighter group consists of two yellow-white class F stars, a subgiant with a visual magnitude of 4.8 and a main sequence dwarf with a visual magnitude of 5.1, and a companion with a magnitude of 7.6 that orbits the main pair at a separation of 7.6 arc seconds. The other group consists of two class K stars separated by 11.5 arc seconds. The sixth component in the Xi Scorpii system is not confirmed to be gravitationally bound to the other stars. It is an 11th magnitude star. The Bayer designation Iota Scorpii is shared by two stars. Iota-1 Scorpii is an evolved star with the stellar classification F2 Ia, on the verge of becoming a supergiant. It is 12 times more massive than the Sun and about 35,070 times more luminous. It has a 10th magnitude companion at a separation of 37.5 seconds of arc. The star is sometimes known by its proper name, Apollyon. Iota-2 Scorpii is a supergiant belonging to the spectral class A6Ib. It has an apparent magnitude of 4.78 and is approximately 3,700 light years distant from the solar system. The star has a distant 11th magnitude companion at a separation of 32.6 arc seconds. Sigma Scorpii is a star system with a combined apparent magnitude of 2.88. It is approximately 568 light years distant. The brightest star in the system is a spectroscopic binary star, composed of two unresolved stars that orbit each other with a period of 33.01 days. The primary star in the spectroscopic binary system is a giant of the spectral type B1 III. It is 18 times more massive than the Sun and has 12 times the solar radius. It is classified as a Beta Cephei type variable. The other component in the system is a main sequence star belonging to the spectral class B1 V. There is another star in the system orbiting the main pair at a separation of half an arc second. At a separation of 20 seconds of arc, a class B9 dwarf with a visual magnitude of 8.7 is also orbiting the main pair. Tau Scorpii is a popular target for astronomers because it is so luminous and hot, and also because, as a result of its slow rotation, the star shows a very clear spectrum. U Scorpii is the fastest known nova and one of the 10 known recurring novae in the Milky Way galaxy. A nova is a cataclysmic nuclear explosion in a white dwarf star that occurs as a result of accretion of hydrogen on the star’s surface. The accumulated hydrogen ignites, causing nuclear fusion. U Scorpii normally has a visual magnitude of 18, but during outbursts it reaches magnitude 8. The last eruption was observed in 2010 and the next one is expected to occur in the year 2020. Upsilon Scorpii is a subgiant star belonging to the spectral class B2 IV. It has a visual magnitude of 2.70 and is approximately 580 light years distant. The star is about 11 times more massive and 12,300 times more luminous than the Sun, and has a radius 6.1 times solar. Omega-1 Scorpii is a blue-white dwarf belonging to the spectral class B1V. It has an apparent magnitude of 3.93 and is approximately 424 light years distant. The star is 9,120 times more luminous than the Sun, and has 11 times the Sun’s mass. Omega-2 Scorpii is a yellow bright giant star of the spectral type G3II-III. It has an apparent magnitude of 4.31 and is approximately 265 light years distant from the Sun. G Scorpii is an orange giant with the stellar classification K2 III, approximately 125.8 light years distant. It has an apparent magnitude of 3.21 and a radius 16 times that of the Sun. The star used to be known as Gamma Telescopii. Eta Scorpii is a yellow-white subgiant star evolving into a giant. It has the stellar classification F5 IV and an apparent magnitude of 3.33. The star is 73.5 light years distant from the solar system. It is believed to be around 1.1 billion years old and has about 175% of the Sun’s mass. It is 18 times more luminous than the Sun. Eta Scorpii is a rapid rotator, with a projected rotational velocity of 150 km/s. It emits X-rays, and shows an enhanced abundance of barium in its spectrum. Rho Scorpii is another binary star in Scorpius. It has the stellar classification B2IV-V and is approximately 409 light years distant from Earth. The primary star in the system is a blue-white subgiant with an apparent magnitude of 3.87. The secondary component has a visual magnitude of 12.8 and is orbiting the primary star with a separation of 38 arc seconds. The designation Zeta Scorpii is shared by two stars separated by 7 arc minutes. The stars are at very different distances from Earth and are not physically related, but they appear close in the line of sight and form a naked eye double. Zeta-1 Scorpii is a hypergiant star belonging to the spectral class B1.5Iae, with an apparent magnitude of 4.705. It is approximately 2,600 light years distant from the solar system. Its visual brightness ranges from magnitude 4.66 to 4.86. The star is a member of the open cluster NGC 6231. It is one of the most luminous stars known, with an estimated bolometric luminosity almost a million times that of the Sun. Zeta-2 Scorpii is an orange giant with the stellar classification K4III. It has an apparent magnitude that ranges from 3.59 to 3.65 and is approximately 151 light years distant. Mu Scorpii is a designation shared by two star systems separated by 0.1° in the sky. Mu-1 Scorpii is a binary star system with a combined apparent magnitude of 3.04, approximately 500 light years distant. It is classified as an eclipsing binary star of the Beta Lyrae type, with the two components periodically eclipsing each other. The primary component is a main sequence star belonging to the spectral class B1.5V, about 8.5 times more massive than the Sun and with 4.1 times the solar radius. The companion is also a class B star, type B6.5V, about 5.3 times more massive than the Sun and with 4.4 times the solar radius. Mu-2 Scorpii is a subgiant star belonging to the spectral class B2IV. It has an apparent magnitude of 3.56 and is approximately 517 light years distant from the solar system. The star has a radius seven times than of the Sun. 18 Scorpii is a solar analog, a yellow main sequence star belonging to the spectral class G2 Va, approximately 45.3 light years distant from the Sun. The star is located on the northern border of the constellation. It has a visual magnitude of 5.503. In September 2003, astrobiologist Margaret Turnbull identified the star as one of the most promising nearby candidates for hosting life, but no planets have been discovered yet orbiting the star. Gliese 667 is a triple star system in Scorpius. The components have visual magnitudes of 5.91, 7.20, and 10.20, and the system is approximately 22.1 light years distant from the Sun. The two brighter components, Gliese 667 A and Gliese 667 B, orbit each other with a period of 42.15 years, and the third component, Gliese 667 C orbits the pair at an angular separation of 30”. When observed without a visual aid, the system appears like a single star with an apparent magnitude of 5.89. Gliese 667 A is a main sequence star belonging to the spectral class K3 V, smaller and less massive than the Sun. Gliese 667 B has the stellar classification of K5 V, and has about 69% of the Sun’s mass. Gliese 667 C is a red dwarf belonging to the spectral class M1.5V. It has two confirmed extrasolar planets in its orbit, and a third planet is a strong possibility. HD 159868 is a yellow dwarf with the stellar classification G5V. It has an apparent magnitude of 7.24 and is 171.93 light years distant. A planet believed to be a gas giant was discovered orbiting the star in 2007, and another extrasolar planet was discovered in 2012. Pismis 24-1 is the largest star in the open cluster Pismis 24, located within the nebula NGC 6357. It has an apparent magnitude of 10.43 and an absolute magnitude of -6.3. It is one of the most luminous stars known. Pismis 24-1 consists of at least three objects and has the stellar classification O3.5If/O4III. Scorpius X-1 is an X-ray source in Scorpius. It has an apparent magnitude of 12.2 and is about 9,000 light years distant. It is a low-mass X-ray binary system composed of a neutron star that draws material off a donor star. Scorpius X-1 was the first X-ray source discovered outside the solar system and it is the strongest source of X-rays in the sky, second only to the Sun. The X-ray flux is associated with the star V818 Scorpii, a blue variable which is the optical counterpart to Scorpius X-1. Scorpius X-1 was discovered by a team led by the astrophysicist Riccardo Giacconi in 1962. Giacconi laid the foundations of X-ray astronomy and won a Nobel Prize for his work in 2002. PSR B1620-26 is a binary star located approximately 12,400 light years away in the direction of Messier 4, a globular cluster in Scorpius. The system lies just outside the cluster. The star system consists of a pulsar (PSR B1620-26 A) and a white dwarf star (PSR B1620-26 B or WD B1620-26). An extrasolar planet was discovered orbiting the two stars in 2000. Wray 17-96 is also one of the most luminous stars known. It is believed to be a luminous blue variable (LBV), and has an absolute magnitude of -10.9 (1.8 million solar units). The star has an apparent magnitude of 17.8 and is approximately 15,000 light years distant. Messier 4 is a globular cluster in Scorpius. It has an apparent magnitude of 5.9 and is approximately 7,200 light years distant from the solar system. 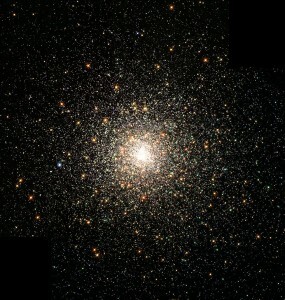 It was the first globular cluster discovered in which individual stars could be resolved. The brightest stars in M4 have an apparent magnitude of 10.8. The estimated age of the cluster is around 12.2 billion years. M4 is about 75 light years across. It was discovered by the Swiss astronomer Philippe Loys de Chéseaux in 1746 and included in Messier’s catalogue in 1764. M4 is easy to find in the sky, as it lies 1.3 degrees west of Antares. Along with NGC 6397 in the constellation Ara, which is also 7,200 light years away, Messier 4 is the closest globular cluster to our solar system. Messier 6 is an open cluster also known as the Butterly Cluster because its stars form a shape similar to that of a butterfly. The cluster was first discovered by the Italian astronomer Giovanni Batista Hodierna in 1654 and Charles Messier included it in his catalogue in 1764. The bright stars in M4 are mostly hot, blue, class B stars, but the brightest one is a class K orange giant, BM Scorpii. The Butterfly Cluster has an apparent magnitude of 4.2 and is approximately 1,600 light years distant from the Sun. Messier 7 is another open star cluster in Scorpius, located near the scorpion’s stinger. It has an apparent magnitude of 3.3 and can easily been seen with the naked eye. It is also known as the Ptolemy Cluster because it was the Greek astronomer Ptolemy who first recorded it in 130 AD. Ptolemy believed the cluster to be a nebula. 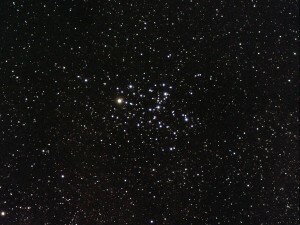 The Ptolemy Cluster contains about 80 stars, the brightest of which has a visual magnitude of 5.6. M7 is approximately 980 light years distant from the solar system. It is roughly 25 light years in diameter. The age of the cluster is estimated to be around 200 million years. 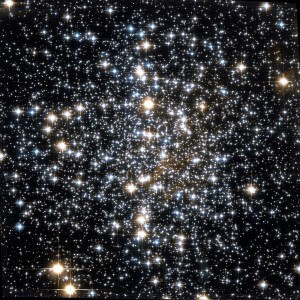 Messier 80 is a globular cluster discovered by Charles Messier in 1781. It has an apparent magnitude of 7.87 and is approximately 32,600 light years distant from the Sun. M80 is about 95 light years in diameter and contains hundreds of thousands of stars. It is one of the most densely populated clusters in our galaxy. The cluster lies halfway between the stars Antares and Acrab. It is visible in moderate-sized amateur telescopes. It is home to a significant number of blue stragglers, blue main sequence stars that appear to be much younger because they are bluer and more luminous than stars at the main sequence turn-off point for the cluster. A nova, Nova 1860 AD, was observed in the cluster on April 21, 1860 by the German astronomer Arthur Auwers. The progenitor star was T Scorpii. The Cat’s Paw Nebula is an emission nebula in Scorpius. It is a vast star-forming region and one of the most active stellar nurseries containing some of the most massive stars known in the Milky Way. It is believed to contain tens of thousands of stars. The nebula was discovered by the English astronomer John Herschel in 1837. The Cat’s Paw Nebula (NGC 6334) is a vast region of star formation. This portrait of NGC 6334 was created from images taken with the Wide Field Imager instrument at the 2.2-metre MPG/ESO telescope at the La Silla Observatory in Chile, combining images taken through blue, green and red filters, as well as a special filter designed to let through the light of glowing hydrogen. NGC 6334 lies about 5500 light-years from Earth in the constellation of Scorpius. The whole gas cloud is about 50 light-years across. NGC 6334 is one of the most active nurseries of massive stars in our galaxy and has been extensively studied by astronomers. The nebula conceals freshly minted brilliant blue stars — each nearly ten times the mass of our Sun and born in the last few million years. The region is also home to many baby stars that are buried deep in the dust, making them difficult to study. 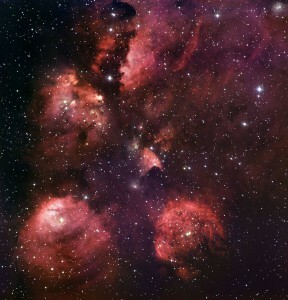 In total, the Cat’s Paw Nebula could contain several tens of thousands of stars. NGC 6072 is a nebula about 1.2’ in size. It has an apparent magnitude of 14. It was created when a medium-sized star ran out of fuel and shed its outer envelope into space. NGC 6281 is an open star cluster. It is the brightest open cluster in Scorpius constellation. It has an apparent magnitude of 5.4 and is about 1,611 light years distant from the Sun. The cluster lies about 2 degrees east of Mu Scorpii. It contains 55 stars with an apparent magnitude of 13.5 or greater within 20 minutes of arc from the centre, and the brightest star in the cluster is 9th magnitude. 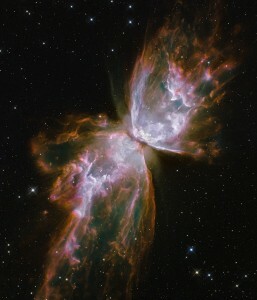 The Butterfly Nebula is a bipolar planetary nebula in Scorpius. It has an apparent magnitude of 7.1. It is one of the most structurally complex nebulae known. The central star, a white dwarf, has a surface temperature in excess of 200,000 K, which makes it one of the hottest stars in the galaxy. It has about 0.64 solar masses and is enveloped in a very dense equatorial disc of dust and gas. NGC 6124 is a bright, large open cluster in Scorpius. It has an apparent magnitude of 5.8 and is approximately 18,600 light years distant from the solar system. 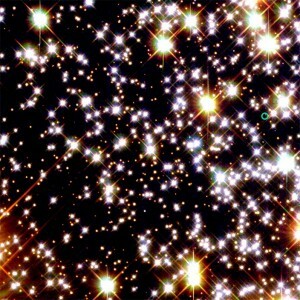 The cluster contains about 125 visible stars. It was discovered by the French astronomer Nicolas Louis de Lacaille in 1751. NGC 6231 is an open cluster in Scorpius. It was named the Northern Jewel Box after the Jewel Box Cluster (Kappa Crucis Cluster) in Crux, which it resembles. It has an apparent magnitude of 2.6. It lies near Zeta Scorpii, and Zeta-1 Scorpii is a member of the cluster. The cluster is believed to be around 3.2 million years old. It was discovered by the Italian astronomer Giovanni Batista Hodierna in the mid-17th century. NGC 6357 is a diffuse nebula in Scorpius. It contains many proto-stars and young stars. It got the name War and Peace Nebula because, when observed in infrared, the nebula’s western part resembles a dove, while the eastern part resembles a skull. The nebula contains Pismis 24, an open star cluster that includes several very massive stars. One of the stars, designated Pismis 24-1, has almost 300 solar masses and it was thought to be the most massive star known until it was discovered to be a binary or multiple star system. Pismis 24-1 is one of the most luminous stars known.